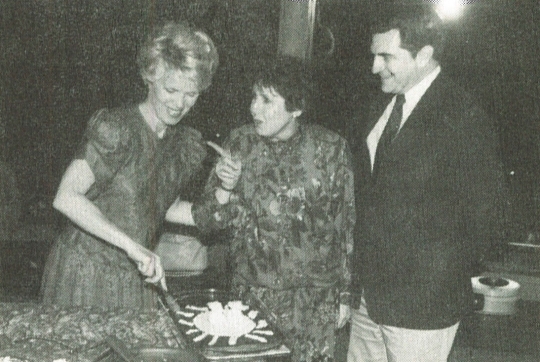 Young Audiences of Atlanta's 4th Birthday in 1987 with founder, Mary-Vance Duggan; board member, John Spiegel; and Executive Director, Ann Alperin. Mary-Vance Duggan is an arts advocate and longtime Young Audiences Arts for Learning supporter. She is currently the Executive Director of one of our newest affiliates - Young Audiences of Southwest Florida (in Naples). In 1975, my family was living in Boston, Massachusetts, when my daughter who was in 2nd grade came home from school and I remember it with great clarity, because with so much excitement, she said that she had to go see an opera. At the age of 31, even though I had been a computer programmer for CBS in New York City, I had never seen an opera. My daughter said, “Oh mother, it doesn’t matter if you don’t understand the words, it’s about feeling. If two people are speaking at the same time it’s noise, but if two people sing at the same time it’s magical”. Two weeks later, she came home and asked if she could take cello lessons. Our daughter was petite for her age and I said, “Well honey, I think the violin would be a better fit.” She said “Oh no, mother the teaching artist said I’d ‘grow into the cello’.” I just had to know who created this program that inspired my daughter. I found out it was Young Audiences of Massachusetts and their teaching artists brought the arts into the schools every month. Their art programs were divine, so I decided to help Young Audiences with a grant from the Junior League and I eventually joined their Board. In 1981, we moved to Atlanta and it was a priority that my children had arts programming similar to the Young Audiences programs in Boston, but there were none to be found in Atlanta. Private schools would bring in symphony ensembles to perform in the multi-purpose room, however, there were few arts organizations who presented arts programs in the public schools. I decided to take matters into my own hands. I met with the Superintendent of the Fulton County Schools and I offered to start a Young Audiences affiliate that would present arts-in-education programs in the Atlanta school system. He was thrilled with the idea. There were so many wonderful people in Atlanta who supported the founding of the YA of Atlanta affiliate: Billy Densmore, who was head of the Northside High School for the Performing Arts; Warren Yost, who was the National Executive Director and Sara Lunsford, Head of the Coca-Cola Foundation; and John Creamer, who was the Chairman of the national Board. For funding, we met with local banks and the Arts Alliance and by the end of one afternoon, there were donations of $50,000 dollars on the table (around $130,000 today with inflation)! I was fortunate enough to have office space donated, and so we were in business. For the next two years, I led the Young Audiences Atlanta Chapter as Executive Director. My husband was transferred yet again in 1985, so I helped choose my successor, who was board member Ann Alperin. For twenty-five years, she was the dedicated Executive Director of YA Atlanta. My family and I moved a total of seven times. And each new place, I wanted to put down roots and make a lasting positive change in the community where we lived. I wanted to give my neighbors the gift of Young Audiences, because YA provided something that I could never provide to my children, an arts integrated education that will forever enrich their lives. My husband jokingly calls it my ‘Johnny Appleseed Syndrome’. For the past 3 years, I have been working as a court appointed special advocate volunteer in Naples, Florida. I work with children who have been put into foster care. That’s what got me involved with the schools again, where I was shocked to realize that many students in the Naples community didn’t have access to the arts due to the emphasis on tsting from STEM and Common Core. I felt my calling to promote Young Audiences once again and I knew what needed to be done. I started researching the arts programs available in the school and in the community. I found that in Collier County there were 58 arts organizations which mostly focused on Out-of-School time programming and a large percentage of that money allocated for the arts is spent on busing students to the OST programs. The national Young Audiences Arts for Learning network is dedicated to providing Out-of-School time programming, however, they also bring thousands of arts integrated program to students during the school day. In Naples, to make the largest impact with arts in education, I knew I had to cut out the travel costs and provide the arts programs at the school locations. Even though Collier county is one of the wealthiest counties in Florida, still 57% of the student families are on food stamps! 62% of students are English Language Learners, and most go home to where English is not even spoken. Students who have participated in YA arts integrated residencies make statistically significant gains in literacy scores (cite Arts for Learning research). The one big difference between other arts organizations and Young Audiences of Southwest Florida is that YA programs not only provide arts to students, they also integrate the arts into every lesson and subject in the school’s curriculum. It’s about a collaboration between a classroom teacher and a teaching artist and how they make this creative synergy possible. For example, our pilot program was a theatre residency where the social studies teacher collaborated with a teaching artist to create a theatrical narrative using a history lesson or social studies topic. The students loved this program because they weren’t just listening to a history lesson delivered by the teacher, but they were actively participating in the related theatre performance – so they were truly learning through the arts. YA Southwest Florida Board Chairman, Deborah Minnick; YA National Executive Director, David Dik; and YA Southwest Florida Executive Director, Mary-Vance Duggan at the 2016 Growing Up with the Arts national conference in Miami, Florida. I contacted the Superintendent’s office and I was persistent in reaching out to them. After meeting with the arts coordinator of Collier County I made my case why it was imperative to start a YA affiliate and implement the arts integrated programs into Collier schools. She agreed with me and advised me to contact the schools in Naples. Last April, I found a middle school teacher who was a perfect match for the pilot program. The teacher went to her students and asked them what they wanted. They said without exception, a theater program. Working with the YA national organization, we quickly found two teaching artists in Fort Myers who were theater pros. This collaboration was fast and furious as we designed the curriculum for the 175 middle school students which resulted in an original play that was staged this May at The Sugden Theatre. The middle school program was such a great success; We are expanding our offerings in other art forms and have been asked to recreate our theatre program in two morw Middle Schools. I look forward to expanding it to High Schools in the next school year. I know in my heart, the way it’s all coming together, it was as if it were meant to be!